Both configurations gives a good out-of-the-box experience with a high level of quality. The full screen AVC codec implementation is pretty neat because they managed to leverage hardware encoders that normally only supports 4:2:0 encoding to reach a 4:4:4 quality level. While 4:2:0 compression is ideal for video content, 4:4:4 quality is needed to make text and still images sharp without blurry side affects. The full screen AVC codec implementation operates best when encoding can be done in hardware (GPU), it can however work with software based encoding (emulated GPU) but that will result in increased CPU utilization. Good to know is that the new HTML5 based web client always leverages the full screen AVC codec implementation. 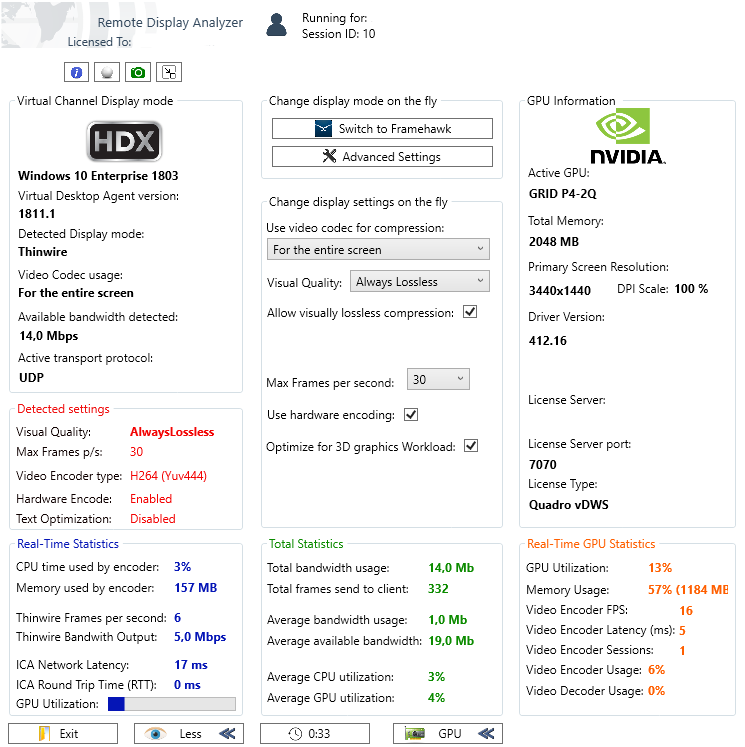 You might have heard that RemoteFX vGPU has been deprecated in Server 2019. Times have changed and GPU virtualization technologies have matured making the API intercept based technologies (like RemoteFX vGPU was) a legacy technology. But no need to get sad about this, because we will get something nice in return: GPU Partitioning or GPU-P for short. It’s still under development but sounds very promising. With this technology multiple virtual machines can leverage the GPU directly (even load balance across multiple GPU’s) and by leveraging the GPU directly Microsoft can move away from the man in the middle role where they needed to maintain the API intercept driver to support new graphic standards. For now we can only leverage the GPU directly by using DDA (GPU pass through) or use GPU virtualization technologies from other vendors. The new GPU-P technology also opens the door for Microsoft to implement this on Azure, which would be a very welcome feature for WVD (the new RDS infrastructure and multi-session Windows 10 edition hosted on Azure). Hopefully Microsoft will not be supporting the GPU-P technology only in Azure like they do with the new multi-session Windows 10 for WVD edition, this will really isolate this technology preventing broader use cases. I don’t think they will be doing this because they pull away RemoteFX vGPU and should provide an alternative for it. With almost every new Windows 10 build the RDP graphics stack is updated, there is not much information you can find about such improvements, but they are certainly there. 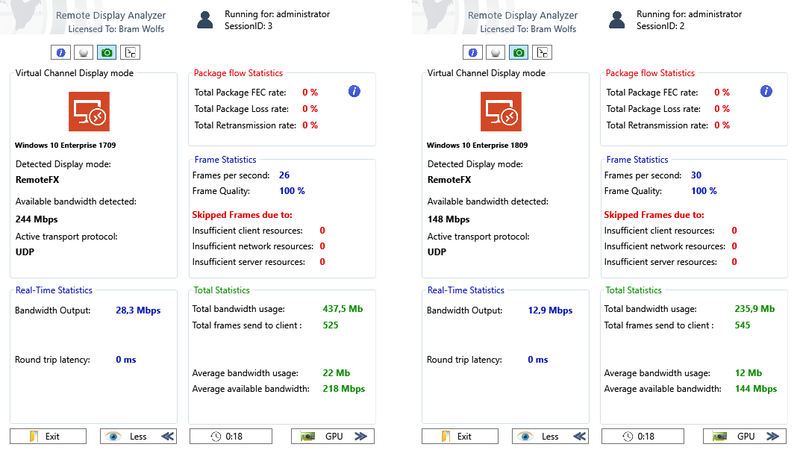 I decided to do a simple test using Remote Display Analyzer to look at the improvements and changes Microsoft made to the RDP protocol in a year time. To do this I used 2 different Windows 10 builds: The 1709 and 1809 build (without updates) this will give more a less an indication of the improvements in a year time frame. While you don’t hear much about it, Microsoft still makes improvements in their remote graphics stack and they should be doing this because it’s one of the most critical success factors of the upcoming WVD platform. The 1809 build performed much better on the LAN then the 1709 build, the lower bandwidth is also great news for WAN scenarios. I’m expecting more protocol improvements inline or shortly after the WVD release, I will certainly keep an eye out on this and will write a new blog post when more information is (publicly) available. Thanks for reading! 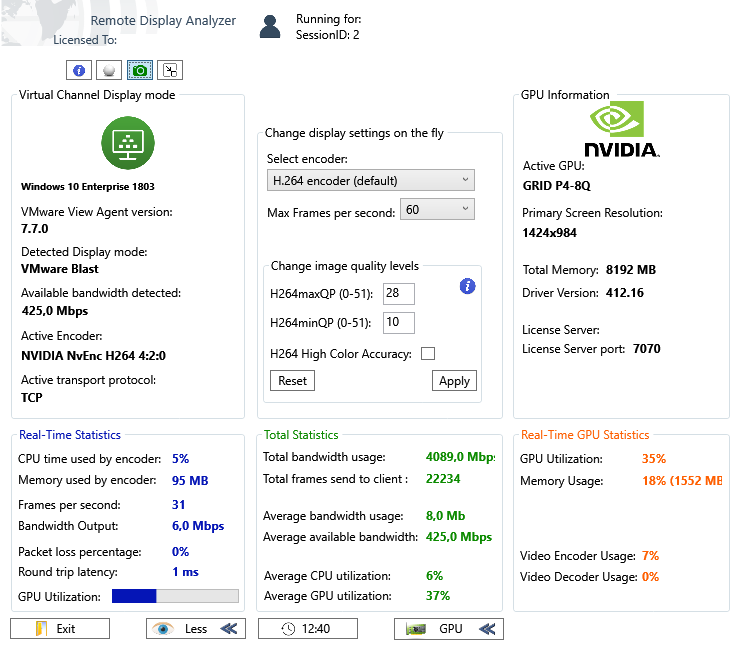 Happy to announce that a new version of Remote Display Analyzer (RDA) has been released. We decided to change the format of the version number to align with new versioning standards and update cycles. The latest RDA build number is 1902.0.52.1 where 1902 is the year and month, 52 is the day of the year and 1 is the build revision. The short name is RDA version 1902. You can check the RDA version number by clicking on the about (i) button. Below you will find some screenshots of the latest RDA version in action. All subscribers should have received a download link to the latest version, you can also download the latest version on the website by filling in the form for the community edition (free) or the subscribed edition, they point to the same executable. Thanks for reading and thanks to the community for testing, validating and providing valuable feedback! Please note that one of the assumptions in this blog post is that you are leveraging Windows 10 Enterprise edition. 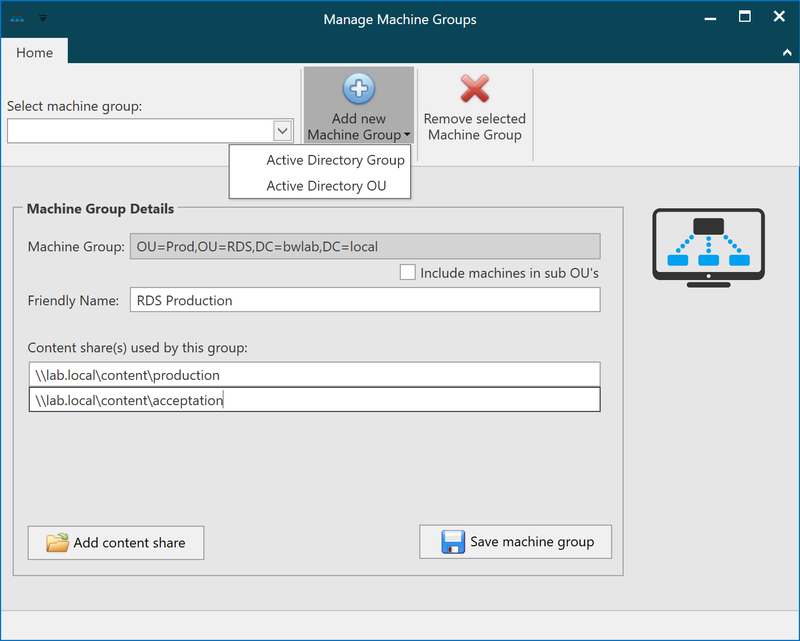 Some design considerations also applies to other Windows 10 deployment types, so this blog post might also be worth reading when you are not designing a Windows 10 Virtual Desktop solution. This separate build of Windows 10 (also known as LTSB) is released by Microsoft for special use cases. Think of locked down and general purpose PC’s you will find for example in factories or in medical peripherals. For this use cases you might not want to leverage new features, but only stay current on security updates. A new LTSB build is released every 2 to 3 years and security updates are supported for 10 years after the release. This is the primary Windows 10 build which receives new features twice a year. One release around March and one around September, you can recognize the release by looking at its name, the first 2 digits are the year, the second 2 digits the month. For example the 1803 is the 2018 March release and 1809 is the 2018 September release. This may sound very obvious, but I often speak people who didn’t know this. Important to take into account is the servicing period for each release: The March release will be serviced for 18 months and the September release for 30 months. As you can see on the below print screen (source: Microsoft). The version of Office that comes with the Office365 subscription and can be downloaded and installed locally, this version is installed by a click-to-run method, which basically is a container based installation similar to App-V. This Office version is also based on a Semi-Annual update Channel (SAC), but can also be configured to receive monthly updates. The latter might not be very practical in a Virtual Desktop solution. This is the on-premises variant of Office like we used pre-cloud era. You know this Office builds by the names: Office 2013, Office 2016 and now Office 2019 has also been released. This Office build is not meant to connect to cloud services, but is intended for restricted (offline) use cases or if you have no Office365 license of course. The LoginVSI benchmark included Office 2013, 2016 and 2019. The results showed that Office 2016 scored better than 2013 but also better than 2019. The latter had a noticeable higher impact and it needs to be deeper investigated to check what the exact reason for this higher impact was. In this option you deploy applications with MSI’s, scripts, etc. Be aware that central deployment and life cycle management can be hard to manage and when you remove applications there is often still footprint (files and registry) of the application which pollutes your image over time. Central deployment tools doesn’t solve this issue and are often not designed for Virtual Desktop solutions. 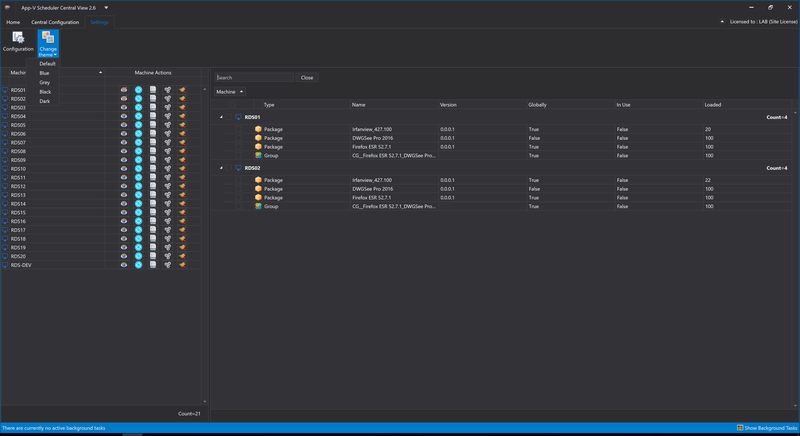 As you might know the App-V client is built-in Windows 10 and ready to use. You only have to enable it. 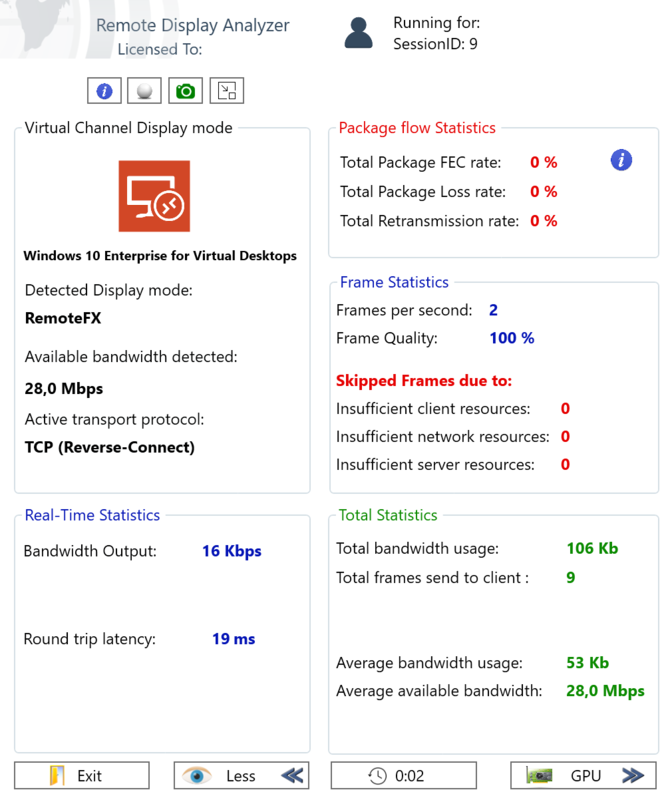 App-V has a lot of great features for both VDI and non-VDI scenarios. For VDI the Shared Content Store mode is a really handy feature in combination with non-persistent images. Consider using App-V Scheduler for real-time insight, control and advanced cache management for your Virtual Desktop solution. This will make your life a lot easier. 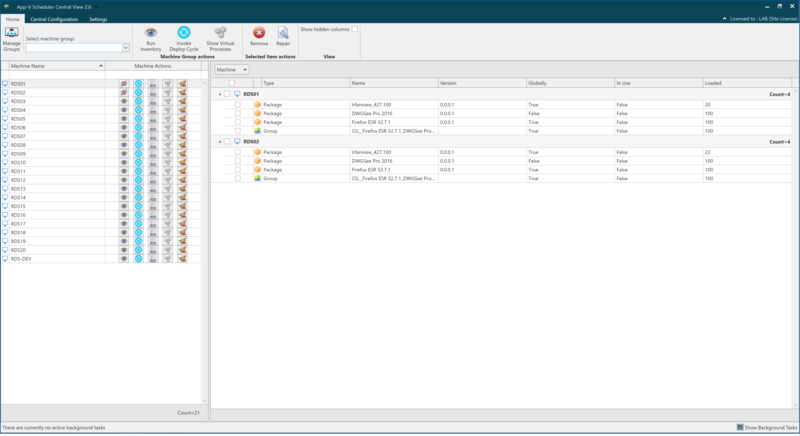 By the way App-V Scheduler is not limited to VDI and also supports RDS and Fat-client\Laptop Windows 10 deployments. App-V will be supported for a very long time, you maybe don’t hear much about it because it’s now part of the operating system and Microsoft doesn’t need to sell it as additional product any more. This application format is based on the UWP framework (also previous known as AppX format). This makes it possible to deploy applications through, for example, the Windows Store. You might want to consider if this matches your deployment strategy and if it makes sense for your VDI environment. There are similarities between App-V and MSIX, like they both run the application isolated from the OS inside a container. There will be even a way to easily convert the file format. MSIX is quite new and lacks real-time deployment and management features, good to know is that App-V Scheduler already started building support for MSIX in the product to support real-time control and management features also for MSIX. You are already a step ahead if you are managing your applications with App-V. The LoginVSI benchmark showed that App-V and MSIX have similar application start times. This was tested with a simple PDF reader. The traditional installed instance had a lower start time, but of course that’s because there is no isolation layer that isolates the application from the OS. Also note we are talking milliseconds here and this might not even impact the perceived user experience. A Windows 10 Virtual Desktop workspace is highly secure because all information stays in the cloud or datacenter and only screen updates are sent to the client. One of the key success factors of your Virtual Desktop workspace is the configuration of your remote graphics stack. The remoting protocols from all major vendors matured over time to the point they are all very suitable for all kinds of general uses cases. It goes without saying that antivirus and anti malware is an important security aspect of your Windows 10 deployment. Whether you use a virtual desktop or not, it’s important to understand the impact of your antivirus solution. Thanks for reading, hopefully this design considerations are helpful for you!